Zion Market Research has published a new report titled “Immuno-oncology Therapy Market by Therapy Type (Monoclonal Antibodies, Immune Checkpoint Inhibitors (PD1/ PDL1 and CTLA-4), Immune System Modulators, Cancer Vaccines and Others), by Therapeutic Area (Lung Cancer, Colorectal Cancer, Breast Cancer, Prostate Cancer, Melanoma, Blood Cancer and Other Cancers) for Hospitals, Clinics, Ambulatory Surgical Centers and Cancer Research Institutes: Global Industry Perspective, Comprehensive Analysis and Forecast, 2016 - 2022”. According to the report, global immuno-oncology therapy market was valued at approximately USD 42.97 billion in 2016 and is expected to generate revenue of around USD 97.34 billion by 2022, growing at a CAGR of around 14.6% between 2017 and 2022. Immuno-oncology or cancer immunotherapy also called as biologic therapy, is a type of cancer treatment that boosts the body's natural defenses to fight cancer. It uses substances made by the body or in a laboratory to improve or restore immune system function. The number of deaths occurring due to cancer is increasing every year and has therefore forced government bodies to take initiatives for the improvement of the health conditions of people, by investing heavily in research and development and enabling innovation and advancements in technology so as to offer improved treatments. Healthcare providers are focusing on improving treatments and reduction in recurrence of cancer post-chemotherapy. This has pushed the growth of the immuno-oncology therapy market globally. Rising R&D in cancer immunotherapy is resulting in the introduction of advanced treatment options that are more effective and efficient. A paradigm shift from traditional chemotherapies to immunotherapies is propelling the overall market growth. Introduction of new drugs has resulted in an increase in the competitive rivalry. Immuno modulatory drugs, such as thalidomide, lenalidomide, and pomalidomide, were the best treatment options available in the past few years. Introduction of newer drug classes, such as monoclonal antibodies and HDAC inhibitors, designed to target receptors related to multiple myeloma, is expected to initiate newer trends in the market. Ongoing studies on similar drugs designed to minimize side effects are expected to propel the market for these drug classes in the immuno-oncology therapy market. 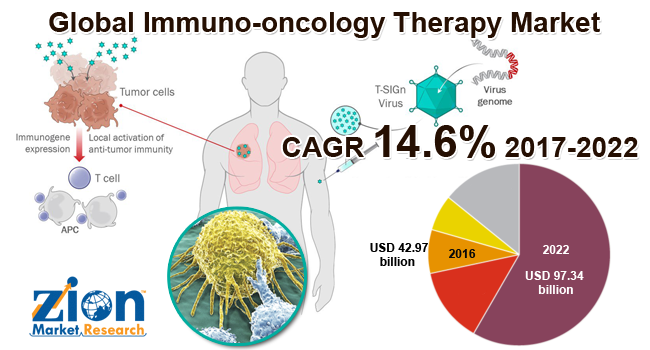 The immuno-oncology therapy market is segmented on the basis of therapy type into monoclonal antibodies, immune checkpoint inhibitors, immune system modulators, cancer vaccines and others. Immune checkpoint inhibitors are further segmented into PD1/ PDL1 and CTLA-4. Monoclonal antibodies segment is expected to grow at fastest rate in the global market over the forecast period. Based on the therapeutic area the market is segmented into lung cancer, colorectal cancer, breast cancer, prostate cancer, melanoma, blood cancer and other cancers. Breast cancer segment is expected to grow at fastest rate in the global market over the forecast period. Hospitals, clinics, ambulatory surgical centers and cancer research institutes are the key end-user segments of the global immuno-oncology therapy market. The hospital's segment dominated the market in terms of revenue in 2016. North America, Europe, Asia-Pacific, Latin America and Middle East & Africa are key regional segments of global immuno-oncology therapy market. North America is anticipated to remain the leading region over the forecast period. Rising incidence of the disease, increasing ease of access to modern therapeutics coupled with expanding geriatric population is propelling the market in this region. On the other hand, factors, such as challenges in clinical trials, coupled with higher costs and rapidly changing reimbursement policies, are impeding the growth of the market in this region. The Asia Pacific is anticipated to show a very high favorable growth rate in cancer immunotherapy adoption. Rising incidence of the disease and in turn, rising mortality rate is propelling demand for immunotherapy in the region. Moreover, the presence of market players with major investments in the market, such as AstraZeneca and Pfizer, Inc., is boosting the market in the Asia Pacific. Some of the key players in immuno-oncology therapy market include Amgen, Inc., AstraZeneca Plc., Bristol-Myers Squibb Company, Eli-Lilly and Company, F.Hoffmann-La Roche Ltd., GlaxoSmithKline Plc., Janssen Biotech, Inc., Merck and Co., Novartis AG, Pfizer, Inc., Sanofi, Spectrum Pharmaceuticals and Takeda Pharmaceuticals. Major players are frequently engaged in mergers & acquisitions to retain their market share and diversify their product portfolio. Also, key parameters affecting competition are rapid adoption of advanced treatment options for improved healthcare coupled with the rising need for optimum capital utilization.